I’ve been working on my Bobble Sheep Pillow pattern for several weeks now, and I am very close to being able to publish it here on the blog! About a week ago, I finally finished the first sheep, and I love how it turned out. Excuse the awkward face I’m making in this photo–I still don’t know how to model my makes without making strange faces! I knew from the start that I wanted to have two sheep pillows: a creamy white sheep and a beautiful black sheep. After I finished the first sheep, the second one went pretty quickly–until I ran out of yarn! The main problem I had was that you can kind of see the pillow behind the bobble stitches. This is hard to avoid, given the size of the hook and yarn that is used. It didn’t matter for the white sheep, but the black sheep made the white pillow inside much more noticeable. The solution? Make a pillowcase! Now, I’ve designed these Bobble Sheep Pillows so that you don’t have to add a zipper. The outer bobble casing completely encloses the pillow inside, so my pillowcase didn’t have to be pretty. Which is a good thing, because mine turned out ugggggly. Even though I have a pretty decent entry-level sewing machine and some rudimentary sewing skills, I really didn’t have the patience to try and set it all up. So, naturally, I grabbed my Skip-Stitch rotary cutter, some fleece remnants, and some chocolate to keep me going! 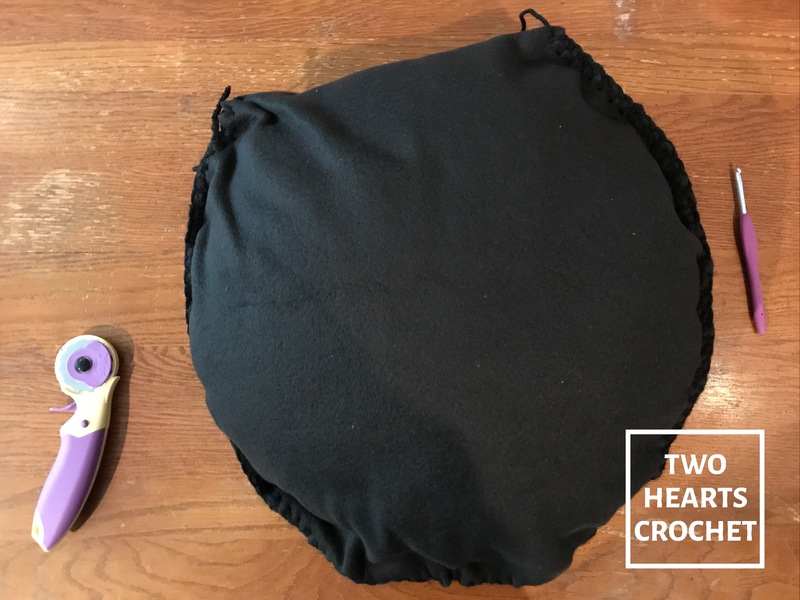 If you want a proper tutorial on how to make a circle pillow case, I recommend this one. 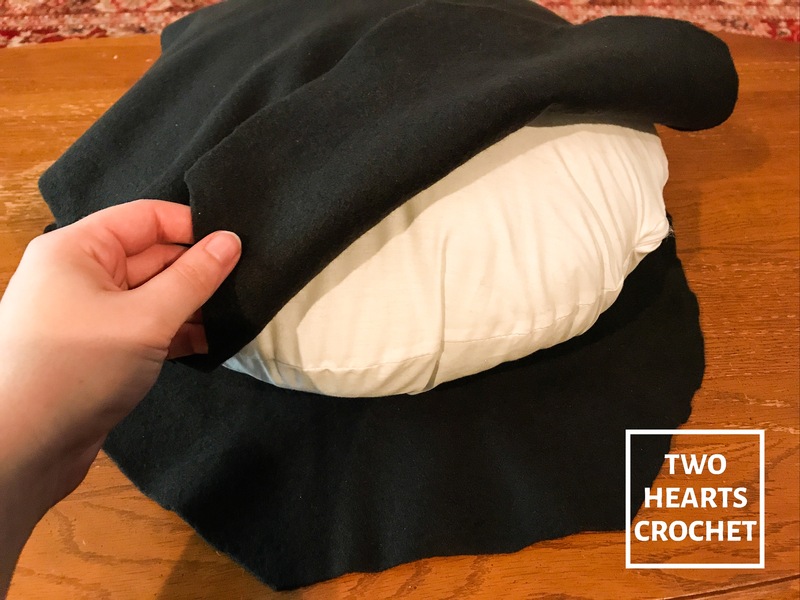 If you’re at all interested in how I manhandled some fleece into a pillowcase, read on! This is not really a tutorial on how to make a pillowcase. But if you’re in a bind, this method will work okay-ish! It’d work even better if you can cut even circles and are better at measuring than I am! To start, I grabbed some black fleece from my collection of fabric scraps. This was leftovers from backing my Star Trek lapghan! Yay for recycling! Next, I moved the pillow aside and laid my fleece “hourglass” out flat on my cutting surface. You can see in the photo that my cutting was terrible…I’d like to blame it on the dull scissors, but most of the problem was my impatience! Using my Skip-Stitch rotary cutter, I unskillfully carefully made some cuts about half an inch from the outer edge. This fleece was pretty thick, so I had to press my cutter pretty hard against the fleece in order to cut all the way through. 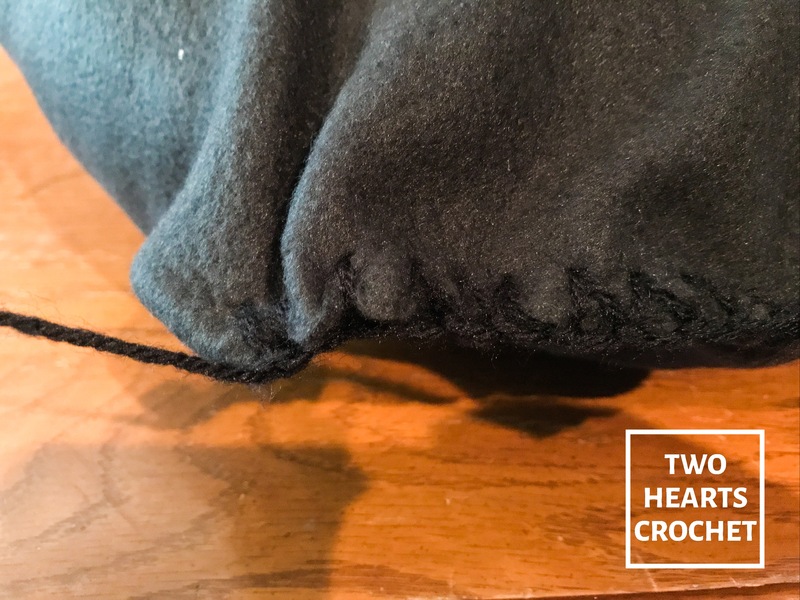 After I’d gone all the way around, I folded the fleece in half again and inserted a size G crochet hook through the holes in BOTH sides of the fabric at one end of the pillow case. 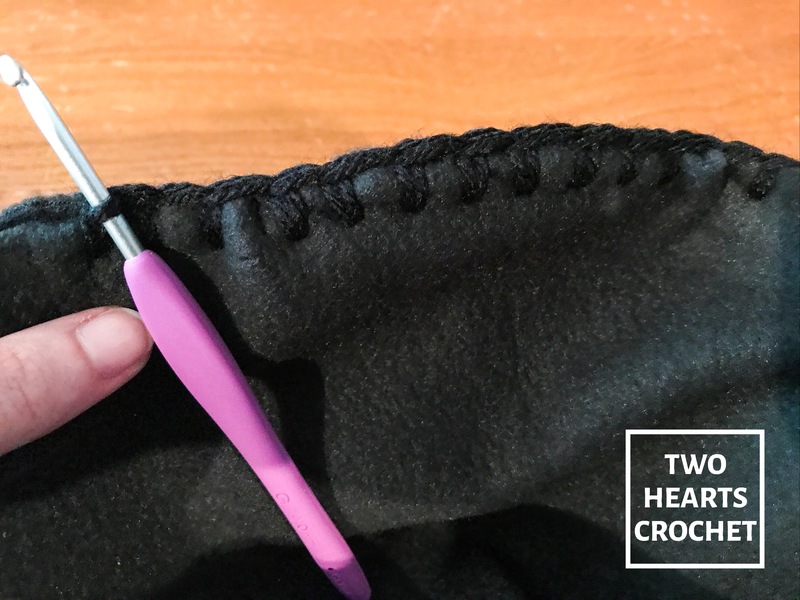 Then, using worsted-weight yarn in black, I pulled up a loop and continued to crochet through the holes around the edge of the pillowcase. I’ll admit, it was not pretty. But I continued in this method until I was about halfway around the pillowcase. Then I inserted my pillow and continued to crochet around the last half of the pillowcase, fastening off at the end. Not pretty, am I right? I barely even wove in the tail ends of my yarn. Who’s going to see this pillowcase outside of the pillow? No one, that’s who! 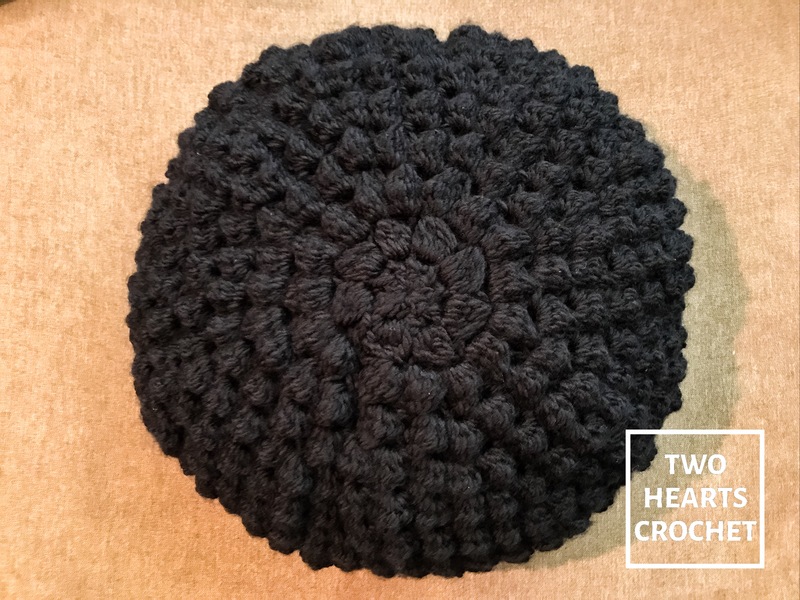 But after I put this pillow inside the outer bobble stitch casing, you can’t even tell! And, most importantly, you can’t see any white bits of the pillow poking through the bobble stitches. Mission accomplished! I’ve finished the head for this Bobble Sheep Pillow, but I haven’t had a chance to sew it on yet. I am planning to do that tonight. Then I’ll snap some much better photos than the one at the top of this post and get the pattern posted tomorrow! I love the white sheep and awesome idea on the pillow case. So looking forward to your next post! BTW! What is your chocolate go to? Ferro Rocher has helped me through some serious Entrelac noodling! Oh, I have SO many chocolates that I love! But if I’m having a super stressful day, I always choose Lindor chocolate truffles. Yum yum!